I swear pimples know the “right” time to pop up. Like, I NEVER get a pimple. And it’s not because of good genes. It’s because of good skincare + healthy diet. Exfoliate regularly and don’t eat too much crap = bye, bye pimples! So here I was, wondering when I’ll have the chance to try the new Epionce Purifying Gel Spot when a gigantic pimple sprung its ugly red head on my chin. How the heck did it know?! Ok, I guess it’s because my healthy diet went out of the window this past Christmas but hey, when else do I get the chance to munch on homemade lasagne and Panettone? The feast was worth the pimple ladies. 🙂 Plus, I didn’t have to deal with it long. Epionce Purifying Gel Spot and Purifying Wash got rid of it fast. I-wouldn’t-have-believed-it-if-I-hadn’t-seen-it-with-my-own-eyes fast. Usually, spot treatments and prescription acne products contain benzoyl peroxide. This baby has anti-bacterial and anti-inflammatory properties that kill P.Acnes, the bacteria that gives you acne. Problem is, it’s harsh AF. If you’ve ever used it, you know that after the pimples are gone, your skin feels drier than the Sahara. Sulfur: it helps reduce oil production, speeds up the skin’s natural exfoliating process so dead cells don’t clog your pores and kills P. Acnes. It has a high pH that can disrupt the skin’s barrier so use it on pimples ONLY. Oh, and don’t worry, it doesn’t smell like rotten eggs here. Phew! Resorcinol Monoacetate: has antibacterial and anti-inflammatory properties that help reduce acne and clear pores. Azelaic acid: it’s antibacterial, anti-inflammatory and even speeds up the skin’s natural exfoliating process. There’s no too much of it here but hey, every little bit helps. Epionce did a study comparing their Purifying Spot Gel with a prescription generic clindamicyn/benzoyl peroxide product. 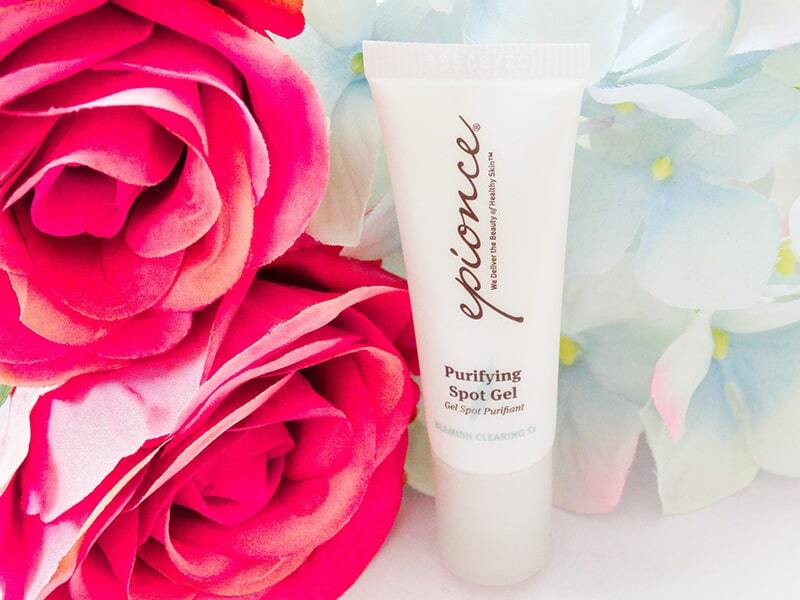 You guessed it, Epionce Purifying Spot Gel got rid of pimples faster and will less irritation. Personally, I’m not surprised by this result. 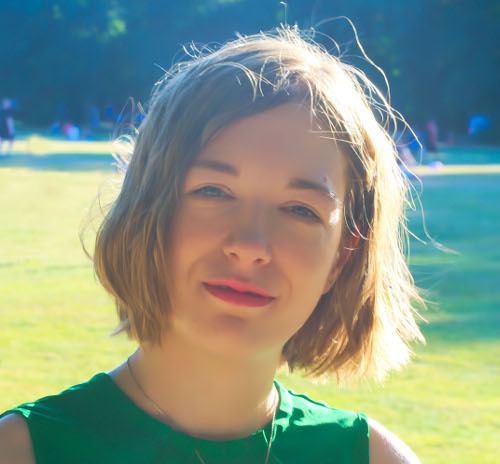 I may not have pimples that often now, but I sure had to deal a lot with acne when I was a teen and I had no idea how to take care of my skin. Back then, I used a lot of spot treatments with benzoyl peroxide and they worked like a charm. But in my experience, anything with sulfur works way faster. I applied Epionce Purifying Spot Gel on top of an angry, red pimple twice a day. When I woke up the next morning, it was half the size – and half as red. I repeated the process the next day. The following morning, the pimple had almost completely disappeared. Plus, my skin wasn’t as dry and flaky as when I used benzoyl peroxide. Did I mention it has a pointed tip that applies the gel right on the spot? The gel itself has a lightweight, refreshing texture that sinks in quickly without leaving a sticky residue behind. The only thing I’d do without is the scent. It’s minty and cool, but you know me, I prefer my products fragrance-free. They’re better for sensitive skin. Related: Is Sulfur The Best Anti-Acne Treatment? My skin didn’t get along as well with Epionce Purifying Wash… and I was totally expecting it. It’s a cleanser made for oily, acne-prone skin and mine is on the drier side. The cleanser uses a mixture of gentle surfactants – like Sodium Cocoamphoacetate, Sodium Cocoyl Glutamate and Sodium Lauroyl Sarcosinate – to gently cleanse skin and remove every last trace of dirt and impurities from your face. Plus, it has 0.6% salicylic acid to exfoliate skin and unclog pores. You know how I always says salicylic acid works better when left on the skin for hours instead than rinsing it down the drain? I still stand by that. But if you need an extra dose or you have sensitive skin that doesn’t tolerate acids for long, massage this cleanser for a minute to get a slightly exfoliating action. Epionce Purifying Wash has a gel texture that lathers slightly when you mix it water. I personally find it a little drying. My skin felt a tad dry after washing. But, as I said, this isn’t aimed at my skin type. Dry skin needs a cleanser low on surfactants and high in emollients. Oily skin the opposite – so it will love this cleanser. I do love the size, though. The tube contains 230ml of product – it’ll last you for months. Epionce Purifying Spot Gel gets rid of red, angry pimples in a couple of days without irritating skin. 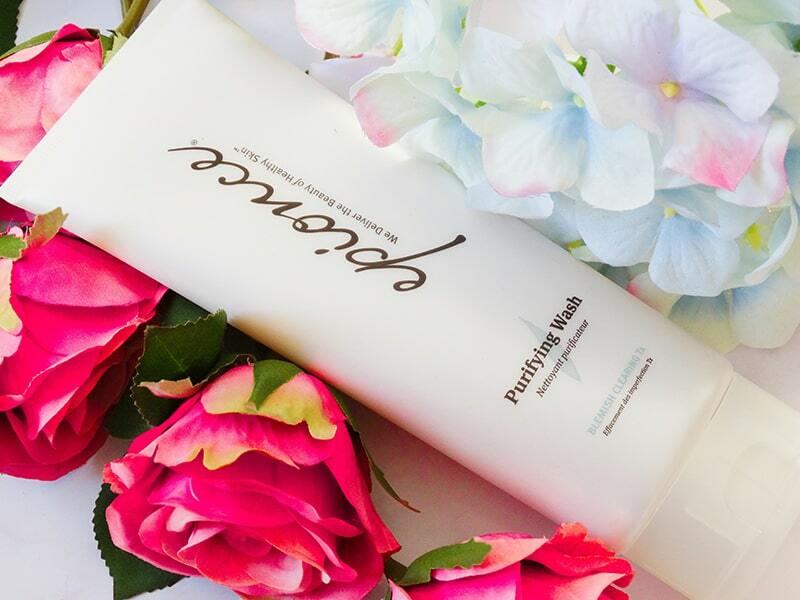 The Purifying Wash gently exfoliates and cleanses skin but is too harsh for dry skin. Have you tried Epionce Purifying Spot Gel and Purifying Wash? Share your thoughts in the comments below. Epionce Purifying Spot Gel Ingredients: Resorcinol Monoacetate 3.0%; Sulfur 4.0% Inactive Ingredients: Azelaic Acid, Butylene Glycol, Caprylyl Glycol, Coconut Oil, Ethylhexylglycerin, Glycerin, Helianthus Annuus Flowering Top, Hexylene Glycol, Hydroxyethyl Acrylate/Sodium Acryloyldimethyl Taurate Copolymer (100000 MPA.S AT 1.5%), Levomenthol, Medium-Chain Triglycerides, Orange Oil, Paprika, Phenoxyethanol, Pyrithione Zinc, Quercetin, Rice Bran, Rosemary, Safflower Oil, Spearmint Oil, Tocopherol, Water. 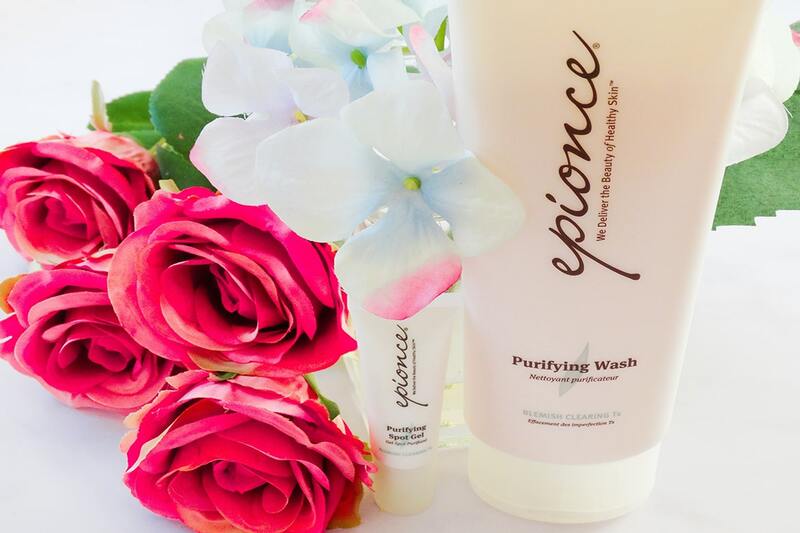 Epionce Purifying Wash Ingredients: Salicylic Acid 0.6% Inactive Ingredients: Water, Glycerin, Lauryl Glucoside, Sodium Cocoamphoacetate, Sodium Cocoyl Glutamate, Sodium Lauryl Glucose Carboxylate, Sodium Lauroyl Sarcosinate, Butylene Glycol, Polyacrylate Crosspolymer-6, Coco-Glucoside, Glyceryl Oleate, Salix Alba (Willow) Bark Extract, Althaea Officinalis Root Extract, Caprylyl Glycol, Citrus Sinensis Peel Oil Expressed, Disodium EDTA, Ethylhexylglycerin, Hexylene Glycol, Mentha Viridis (Spearmint) Leaf Oil, Menthol, Phenoxyethanol, Phoenix Dactylifera (Date) Fruit Extract. Sarah, I haven’t trued that yet because I don’t have dark spots. But it has Undecylenoyl Phenylalanine, a new skin-lightener that’s been proven in preliminary research to lighten dark spots. We need more studies about it but so far it’s promising.